Social trading is a growing trend in cryptocurrency and if done correctly can bring large ROI to investors with minimal effort. As with everything related to cryptocurrency investing, there have been mixed reviews of these social trading tools and platforms which can be confusing for new investors. 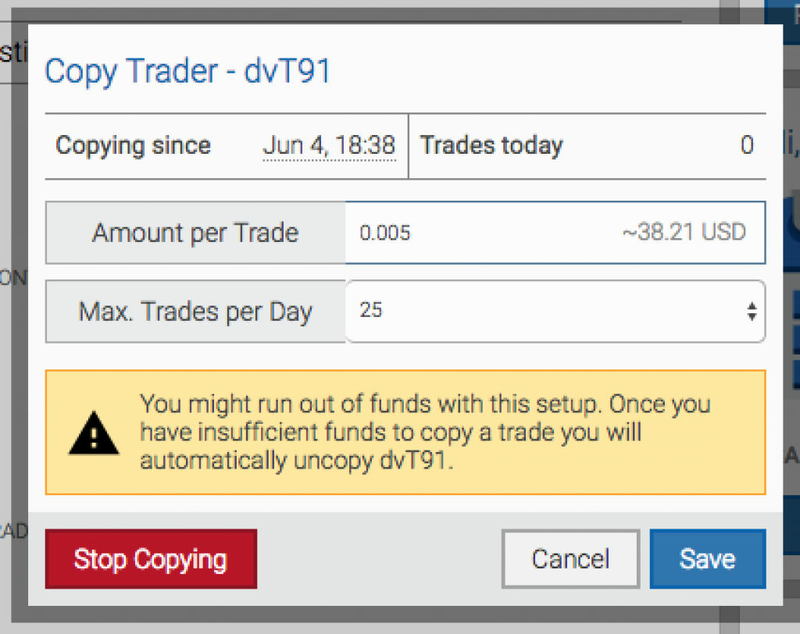 So is using a “copy trade” feature profitable? 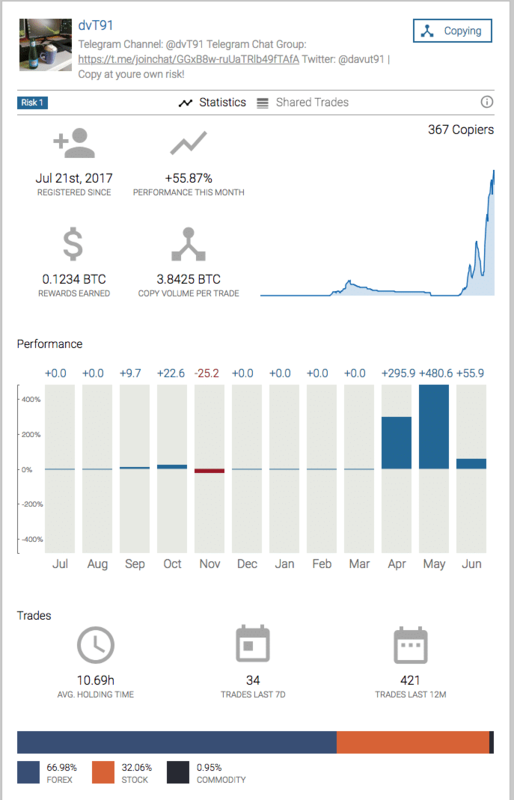 Coinformant has decided to do an ongoing case study using the social/copy trader feature on 1Broker.com. 1Broker has a large amount of profitable traders that can be copied with varying levels of risk. 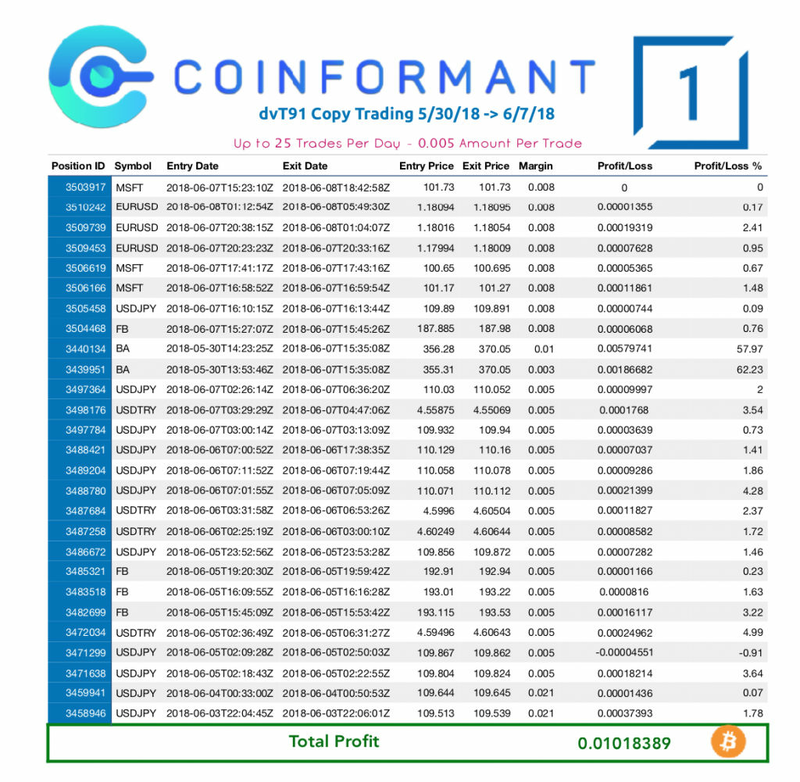 For the start of our study, Coinformant decided to copy a “Risk Level 1” trader with previous success and a large amount of copiers. Keep in mind that even when copying a trader on 1Broker, you always have the ability to manually close any trade you open. This can be helpful if you copy a trader that is losing more than winning. dvT91 was able to produce a +450% return to his copiers for the month of May 2018 and has 350+ copiers on the 1Broker platform. He is also a very active trader which gives us the ability to trade using a smaller balance. After choosing a trader to copy, we then had to decide the amount of trades we would like to copy as well as the amount of BTC to be used for each copied position. Since this is the 1st time the staff at Coinformant.com is “social trading”, we decided to start with small positions. If all goes well, each week we will increase the amount of BTC used per trade. After the first week of copying dvT91 our account is in the green. Amazingly we only took 1 loss for less that 1%, all other trades were profitable. As we move on to Week #2, we will be increasing our amount per trade to 0.0080000 BTC and re-investing week 1’s profits. It is still very early in this case study, but the 1st week of trading makes this feature look very promising. Stay tuned for Week 2 updates, and make sure to follow us on Twitter for real time updates of trades using 1Broker’s “Copy Trader” feature.